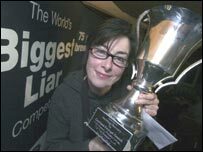 Award-winning TV comedienne Sue Perkins has been named the World's Biggest Liar in an annual fibbing competition, which was held in Cumbria. She won the 100-year-old contest with a tale of flatulent sheep causing a hole in the ozone layer. One half of the famous TV double act of Mel and Sue, the comedienne is the first woman to win the historic title. A 200-strong audience in Wasdale, heard how Sue's "muttons of mass destruction" broke wind after eating too much grass. Ms Perkins provided tough competition for the other contestants, who told stories about wind farms propelling Britain to warmer climes, talking dogs and a holiday village dubbed "Lowcatraz". Her tall tale went on to describe how after the ozone layer was damaged, ice caps melted and people in the Home Counties had to be taken to work on camels. After being crowned biggest liar, she said: "I'm aware that it was a controversial decision to give the prize to a woman, but I hope to come back next year and defend the title to show it wasn't a fix." The annual event is held in memory of Will Ritson a Cumbrian landlord who would often elaborate on the truth to keep 19th Century drinkers entertained. Participants have up to five minutes to tell the biggest and most convincing lie they can, without the aid of props. The contest attracts entrants from as far afield as South Africa and New Zealand.